Download the new Definitive Guide to Digital Publishing today! 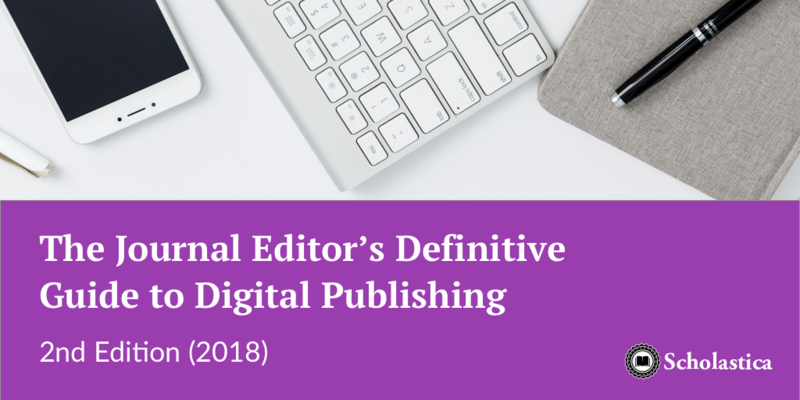 We’ve just released the 2nd edition of The Journal Editor’s Definitive Guide to Digital Publishing with new examples of successful digital publishing practices. Get your copy here! In today’s digitally-driven research environment, it’s not enough for academic journals to simply have a website. They need to begin to transition to modern, digitally-driven publishing practices. Most journals realize this, but figuring out how to go about it can be tricky. Editors don’t always know which aspects of their online publication need updating or how to make changes effectively. If you’re working to modernize your journal’s online presence and not quite sure where to focus your attention first, we just released a resource to help. The NEW 2nd edition of The Definitive Guide to Digital Journal Publishing (2018) covers everything you need to know about the evolving digital publishing landscape, including how to make your journal more discoverable in online searches, modernize the look and feel of your publication website, and use software and services to lower the cost of article production so you can make research more cheaply or freely available. In the 1st edition of The Journal Editor’s Definitive Guide to Digital Publishing eBook we talked about what it means for journals to enter the “digital age.” Now, almost 2 years later, we can’t emphasize enough the importance of digitally driven journal publishing. While debate remains as to whether scholars prefer online reading over print, there is no question that they are increasingly taking to Google Scholar and other online databases to conduct research. The 2012 Ithaka S+R US Faculty Survey of over five thousand faculty members at four-year colleges found that over 60% of participants preferred “exploring references” online. Similarly, the 2015 MIT Library Survey found that more than 80% of the community preferred electronic journals, collections of papers, and conference proceedings. There’s no question that scholars are looking for content online. As a result of the academic community shifting towards digital research consumption and dissemination, many journals are transitioning to digitally-focused or digital-only publishing models and countless others are “born digital.” It’s crucial for your journal to hone its online presence and reader experience in order to remain current. The eBook includes commentary from leading scholars including, Cambridge mathematician Sir Timothy Gowers, who discusses how he launched the academic-led arXiv overlay journal Discrete Analysis. Additionally, it includes an overview of how to add DOIs to your journal from Crossref Member and Community Outreach Manager Anna Tolwinska, and advice on getting added to relevant scholarly indexes from Roland Meesters, editor-in-chief of Journal of Applied Bioanalysis. Now’s the time to modernize your online publishing practices, and the new 2nd edition of The Journal Editor’s Definitive Guide to Digital Publishing has all of the tips and tools you need. Download this new and improved guide to learn which areas of digital publishing your journal should tackle first and how you can embrace new publishing opportunities online to reach a wider audience. We hope you enjoy this free resource and invite you to share it with your colleagues. We’d also love to hear what you think about it! Let us know on Twitter by tweeting at @scholasticahq! One of the primary areas authors will consider before submitting to your academic journal is how you handle copyright. In this blog post, we overview how to best communicate copyright policies to authors.